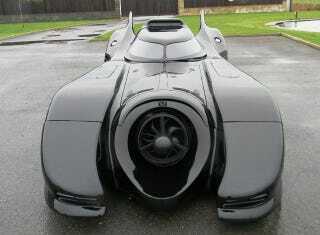 Anybody Want To Buy A Batmobile? The Historics Auction House at the Brooklands Museum in Weybridge, England will be auctioning one off on November 30th. This extremely well conceived tribute to the 1989 Michael Keaton Batmobile was made for promotional purposes and has been displayed at many exhibitions and motor shows. It comes complete on a bespoke chassis and powered by a straight six, fuel injected modern Jaguar 3.2 litre engine with automatic transmission. Special crime fighting gadgets include a fully operational flame thrower at the rear, hydraulic suspension enabling the car to be lifted a further nine inches off the ground, a smoke release mechanism, remote full releasing electronic canopy, remote ignition and full LED running lights, dashboard display and front and rear camera's complete the specification. This vehicle is believed to be one of the best after-production, fully road-legal models ever made. The price that the car will sell for is estimated to be between 70,000 and 90,000 British pounds (112,000 ish to 145,000 ish U.S.).